Kevin Wideman, a three-decade government contracting veteran, has been named CEO of Chantilly, Va.-based Koniag Government Services. He will oversee KGS’ efforts to deliver management consulting, application development and other shared services to government clients at the federal, state and local levels, KGS said Friday. Wideman previously served as chief operating officer of ASRC Federal‘s Vistronix, subsidiary, where he played a role in the software vendor’s growth efforts. 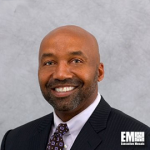 Before that, he worked at General Dynamics (NYSE: GD) as vice president of its information technology business and at SIGNAL Corp. as an executive vice president. He holds a bachelor’s degree in electrical engineering from Temple University.